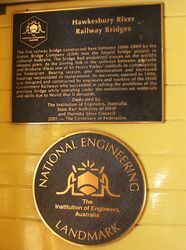 A plaque recognises the Hawkesbury River Railway Bridges as a National Engineering Landmark and a link to the Federation of Australia. The Institution of Engineers Australia, through its Heritage Committees, established the Australian Historic Engineering Plaquing Program to acknowledge past engineering achievements and to draw public attention to the significant contributions they have made to society. The Plaquing Program is a means of bringing public recognition to significant historic engineering works and the engineers who created them. 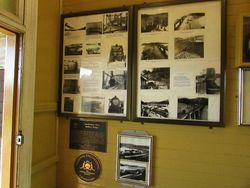 The Program is intended to contribute to the conservation of Australian engineering heritage. The first railway bridge constructed here between 1886 -1889 by the Union Bridge Company (USA) was the largest bridge project in colonial Australia. The bridge had pinpointed trusses on the world`s deepest piers. As the joining link in the railways between Adelaide and Brisbane it was one of Sir Henry Parkes' symbols in campaigning for Federation. Bearing seizure, pier deterioration and increased loading necessitated its replacement. Its successor, opened in 1946, was designed and constructed by engineers and workers of the NSW Government Railways who succeeded in solving the probles of the previous bridge while operating under the restrictions on materials and skills due to World War II demands.